A Cessna 208B Grand Caravan operated by Makani Kai Air sustained substantial damage in a landing accident at Kalaupapa Airport, Hawaii. The aircraft came to rest on the right side of the runway. The nose landing gear had collapsed and the right hand wing tip was bent. Kalaupapa Airport is an uncontrolled (nontowered) airport with a single runway and no taxiways. The pilots use a common frequency to state their intentions. The pilot of the Grand Caravan reported that she was going to establish an approach and landing to runway 05. While on a seven-mile final, she communicated with the pilot of an airplane that was on short final for the same airport. The pilot that was on short final reported that he would report when he was clear of the runway, and he did. The commuter pilot acknowledged the other pilot's clear of runway transmission, and initiated the approach. 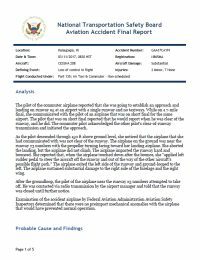 PROBABLE CAUSE: "The pilot’s loss of directional control during the aborted landing, which she conducted due to another airplane, whose pilot had reported being clear of the runway, still being on the runway, and resulted in a hard landing and ground loop." Distance from Honolulu International Airport, HI to Kalaupapa Airport, HI as the crow flies is 99 km (62 miles).